As one of the vocalists for the late-'80's cult band Sugarcubes, Björk Guðmundsdóttir was one of the very first music stars from the ever-experimental Iceland scene to achieve success beyond her native country. After the Sugarcubes split in the early '90's, Björk began a more successful solo career under her first name, and has made increasingly distinctive dance club-oriented albums. In addition, she received acting plaudits for her lead performance in the 2000 Lars Von Trier film Dancer In The Dark. 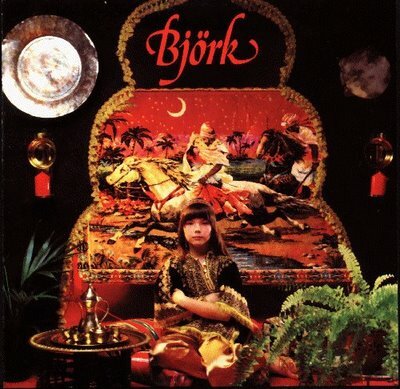 What many people don't know is that Björk recorded a self-titled children's album in 1977 at the age of 11, released only in her native Iceland. (Therefore, her 1993 album Debut is actually not her solo debut). Björk studied classical piano as a child. She received a recording deal after her teachers submitted a tape of her singing the Tina Charles disco song "I Love To Love" to Radio One in Iceland. The 1977 album was sung in Björk's native tongue, and contained songs about (among other things) fairy-tale cows and reindeer. One song, "Búkolla", is sung to the tune of the Stevie Wonder/Syreeta Wright composition "Your Kiss Is Sweet". Another, "Álfur Út Úr Hól", translates into "Elf From A Hill"; sure enough, it's sung to the tune of the Beatles' "Fool On The Hill". The closing track "Bænin" is based on Melanie's "Christopher Robin". Björk's young voice (sometimes recognizable by her accent) is largely accompanied by piano and wind instruments. Her stepfather Sævar Arnason played guitar. Two of the tracks are instrumentals; one of them, "Jóhannes Kjarval", is named after an early-20th-century Icelandic painter, and was composed by young Björk. Besides having obvious novelty value as a foreign-language children's album from a little-known culture, Björk is entertaining if you listen to it in the right frame of mind. It's a charming specimen of childhood (not to mention pre-punk, in her case) innocence, albeit one without subtitles. The overall sound does have a foreign ambience, but it is still accessible to English-speaking listeners. A few of the songs (especially "Óliver" and a cover of Edgar Winter's "Alta Mira") are reminiscent of the Jackson 5. Björk shows a chapter of the singer's career that does not deserve to be overlooked. Unfortunately, a proper reissue is probably impossible. The Icelandic Fálkinn company, which is primarily a manufacturer of bicycles and machinery, divested its music label in 1986, and the album's master tapes were reportedly lost. In the ten years between the release of that album and the formation of the Sugarcubes, Björk became part of a burgeoning post-punk music scene in Iceland. 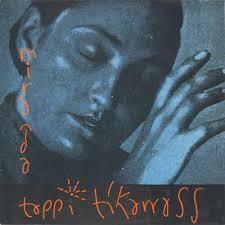 One of the bands she was involved with was called Tappi Tikarrass. The band's only full-length album, titled Miranda, was released in Iceland in 1983. The teenage Björk sang lead vocals on all but the first and last tracks (those were sung by a less talented male singer), and all of them are sung in Icelandic. The material is not great -- most of the goth-rock songs sound like skeletal imitations of early Cure and Siouxsie and the Banshees -- but Björk is in good voice here, perfecting the purring and wailing that are now her trademarks. The better tracks ("Beri-Beri", "Hvítibjörn") sometimes presage the directions she would take with the Sugarcubes and on her '90's solo albums. 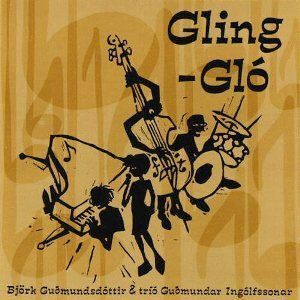 If you've ever wondered what type of musician that precocious youngster might have grown up to be if she had never encountered punk rock, the 1990 Icelandic release Gling-Gló may answer the question. Björk recorded the album as a side project during her days with the Sugarcubes. Backed by an exuberant jazz trio who provide piano, percussion and string bass sounds, Björk performs 14 Icelandic pop classics, as well as two English-language American ones ("Ruby Baby" and "I Can't Stop Loving That Man") that fit right into the program. Most of the songs resemble American big band swing, which was much-played on Armed Forces Radio in Iceland during the 1950's. Besides being a revealing glimpse into her homeland musical roots, Gling-Gló is an utterly charming temporary return to the child-like innocence of Björk's 1977 debut. When contrasted with that album, one can see the strides Björk had taken to develop her unique vocal style. Her delightful singing makes Gling-Gló thoroughly entertaining, regardless of the foreign-language lyrics. You've come a long way, baby. (Note: the CD was released in the U.S. in September 2003).